What weighs more? A tonne of feathers or a tonne of lead? Umm and this has to do with showers how?? Well, let me explain…Years ago I spent a few weeks staying with a friend (hi Judy!) who lived in New York. She rented a flat in an old brownstone block and I was there for a couple of weeks one winter. Outside it was sub-zero temperatures; inside it was the hottest place I had ever stayed in. The radiators were massive cast-iron beasts, the heating was on 24/7 and there was no way to turn them off or even down. Because the air was so hot and dry inside Judy had the windows opened permanently and bowls of water scattered around the flat, which were refilled every day. The idea of the bowls of water was to increase the humidity in the air. Maybe it helped but my skin was really dry while I was there. The point of this tale is that Jon Bootland (erstwhile direct of the Sustainable Building Trust) told me the air in his bedroom is so dry at night he turns the shower on before he goes to bed to increase the humidity. So Bowls of Water Mark 2. Though he reckons it doesn’t help much either. The conversation naturally flowed from there to the fact that opening the bathroom door after a shower is a fail-safe method, in the absence of a fan, to get the warm moist air formed after a shower out of the room. We both suffer from mould – who doesn’t in this day and age – and think this is a better method than opening a window. Water vapour is obviously heavier than air – fill a balloon with air and it weighs far less than the same balloon full of water– so it will move out of the bathroom and fall down the stairs into the hall where the radiator will dry it out and bish bosh sorted… But are we as smart as we think we are? In 2014 I wrote an interesting blog on the humidity levels in Dan’s bathroom after his shower, and before that a bit about mould formation. But I didn’t check out the assumption above. So now was my chance. Water vapour, is one state of water within the hydrosphere. It can be produced from the evaporation or boiling of liquid water or from the sublimation of ice. My bathroom might feel a bit brass monkeys of a morning in February, but it’s not cold enough to sublimate ice. And in fact the ‘steam’ effect you see after a shower is not actually water vapour at all. Because you cannot see water vapour. The ‘steam’ is water droplets in the air that have exited the shower. As the air moves around the rest of the shower and bathroom, it gets closer to room temperature and the colder air can’t hold as much water, so it condenses and water droplets are formed. So does opening the bathroom door and allowing the moisture laden air to swirl through the rest of the house work? Well the idea is that it does because we are taking x amount of water vapour and mixing it with a pile of other, drier air in the rest of the house, thus lowering the relative humidity of the air in the bathroom to below the level at which mould can thrive whilst increasing the humidity in the rest of the house but not by enough to cause problems. Only then I discovered the following – water vapour is lighter than air!! Not only is this counter intuitive, it also puts the kybosh on the moist air tumbling down the stairs theory. Damn! But how? Well, water is composed of a hydrogen atom and two oxygen atoms (H2O) and has a molecular weight of 18 grams per mole. (One mole of a gas, at standard conditions, has a volume of 22.4 litres.) “Dry” air contains no water vapour, and is mostly a mixture of molecular nitrogen (N2) and molecular oxygen (O2). 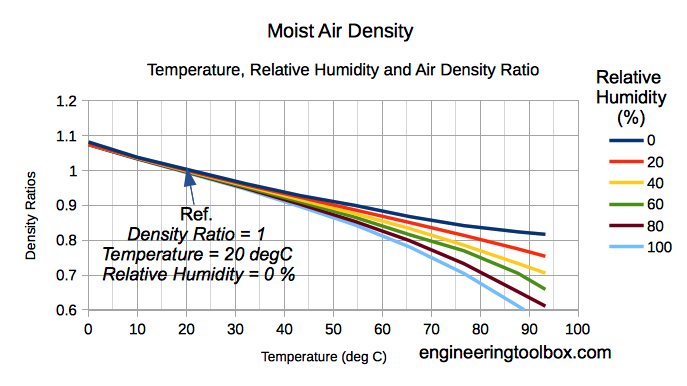 The molecular weight of dry air is 28.97 grams per mole. Since mole per mole, dry air is heavier than water vapour, any mixture of dry air with water vapour will weigh less than pure dry air. The more water vapour in the air, the smaller its molecular weight will be. Jon was so excited by this piece of information which, even though he’d done a degree in chemical engineering, was news to him that he decided to teach me some basic chemistry which is useful as due to a mis-spent youth I know virtually zero about the subject. So 1 mole is 6.0 x 1023 molecules. And … Nitrogen has an atomic mass of 14, Oxygen has an atomic mass of 16, whereas Hydrogen has an atomic mass of 2. So H2O has a molecular mass of 20 [(2 x 2) +16]. Oxygen is O2 so has a molecular mass of 32. Nitrogen is N2 so is 28. 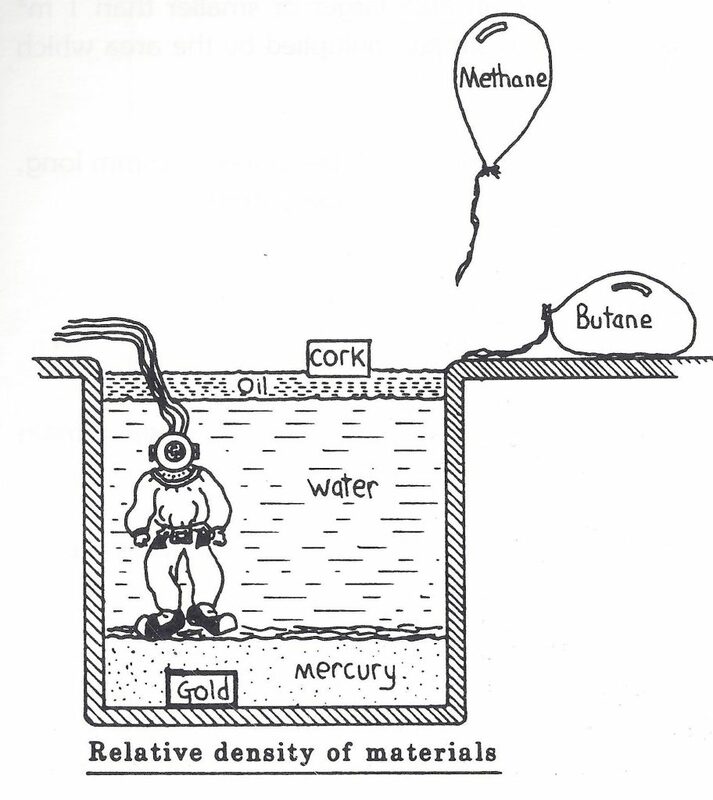 And I then remembered this diagram from when I first learnt plumbing, which although has neither water vapour nor liquid nitrogen in it is still pretty cool. When vapour content increases in moist air the amount of Oxygen and Nitrogen are decreased per unit volume and the density of the mix decreases since the mass is decreasing. So, dry air is more dense that humid air! As shown here. All of which means that now we know that moist air is heavier than dry air means it will skulk around upstairs. Since that’s where we sleep, it now adds another whole pile of extra moisture to the air. It’s reckoned that 225 ml of water is added to the air overnight per person from sleeping, and I did read the figure of 1.1 litres from the average shower (though we all know that ‘the average shower’ can mean different things to different people). But it could explain the mould on Suhith’s black jeans. And back to the question I asked at the start, re what weighs more, a tonne of feathers or a tonne of lead. Well, they both weigh exactly the same obviously, i.e. one tonne. It’s just the amount of space they take up that is different. If we assume the density of feathers to be 0.0025 g/cm3 or 2.5 kg/m3, then a tonne of feathers takes up a volume of (1000 kg / 2.5 kg/m3) = 400 m3! Lead, in contrast, is about eleven times heavier than water for the same volume, so a ton of lead can be imagined as a metre square by 90 mm thick. Or as Mu (my mum) used to say…a tonne of lead if it fell on your head! The mass of 1m3 of dry air is 1.29 kg and the mass of 1m3 of water is 1 tonne or 1000 kg. So, if my maths is correct, 775 times heavier.